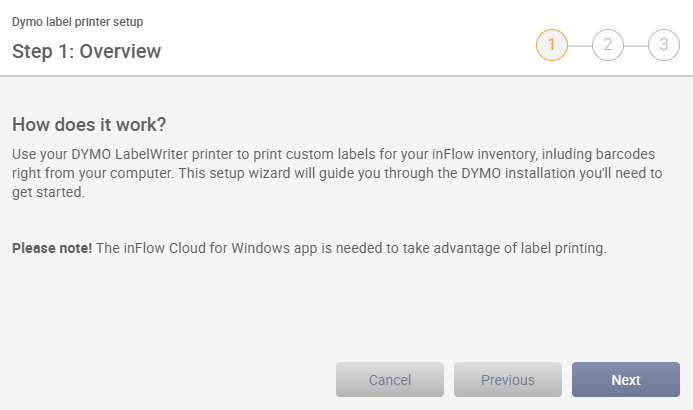 How can I print product labels to my Dymo printer in inFlow Cloud? Do you own a Dymo printer? Good news! 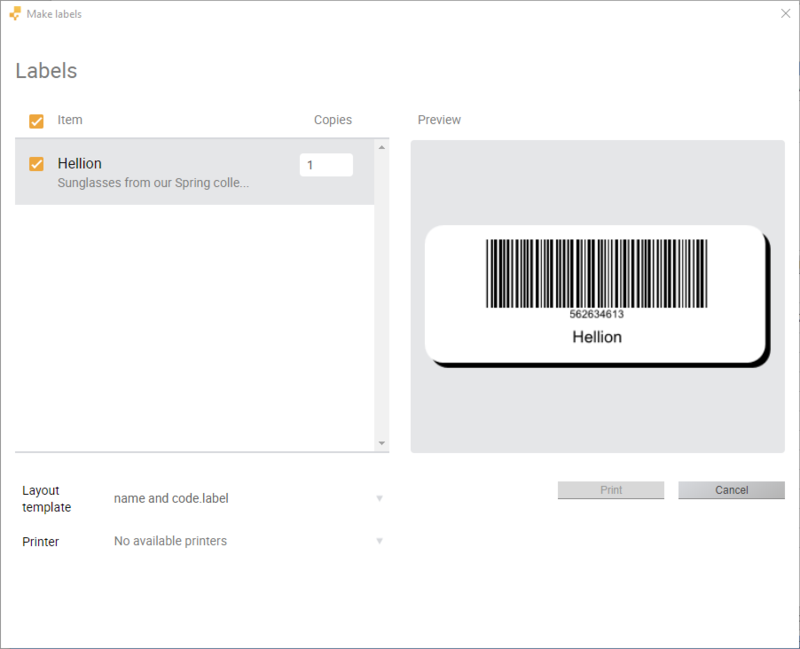 You can print product labels directly from the inFlow Cloud Windows app! How can I print the labels? You’ll need to make label templates for this integration. 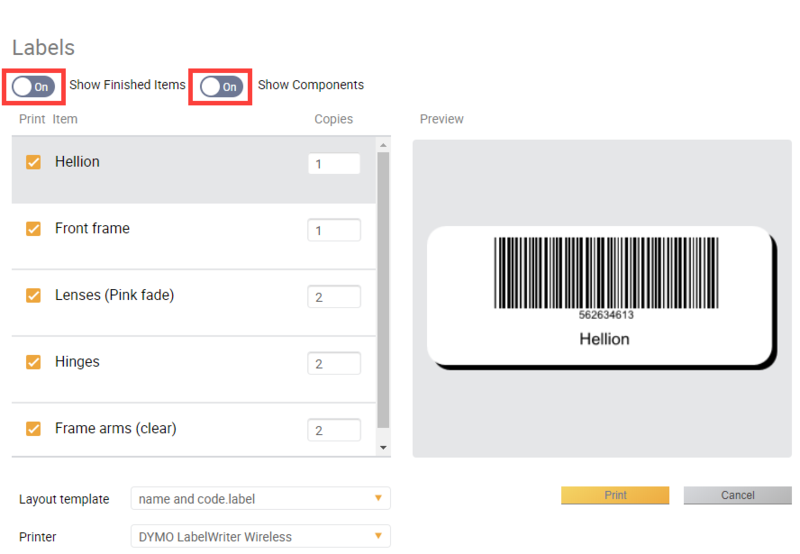 To begin, take a look at our templates article on how to create labels with your Dymo software, and use our inFlow codes. We’ve tested and recommend the Dymo LabelWriter 450 but you should be able to use this integration with most Dymo printers. Go to Main Menu > Options > Integrations. The inFlow web app will open in your browser. (Continue to Step 3 below). Click on the Dymo logo to begin the setup. The Step 1 window will give you a quick overview about the Dymo integration. Download and install the Dymo software/drivers to your PC. Downloading from this link will ensure you have the most up-to-date version available from the Dymo website. Once downloaded and installed, click Next to continue. 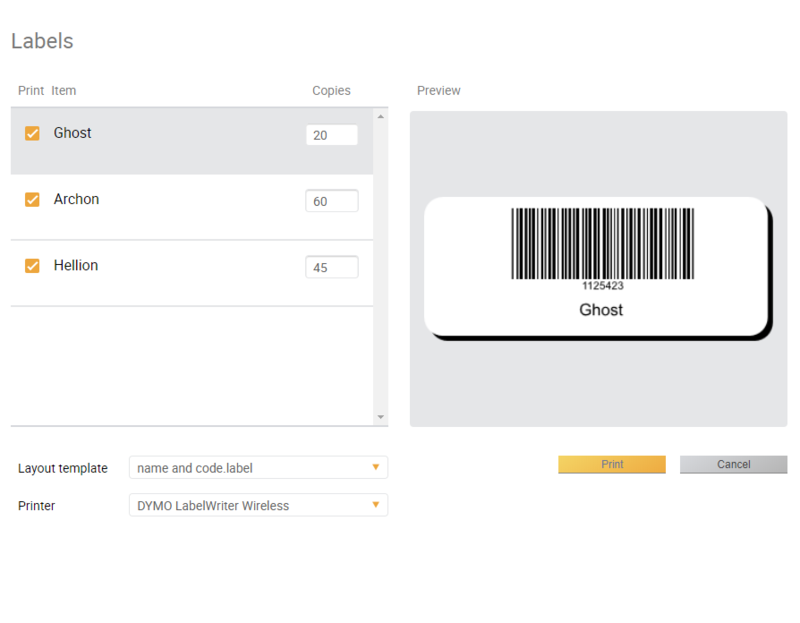 For Step 3 of the installation, you’ll need to upload a label template created in the Dymo software. 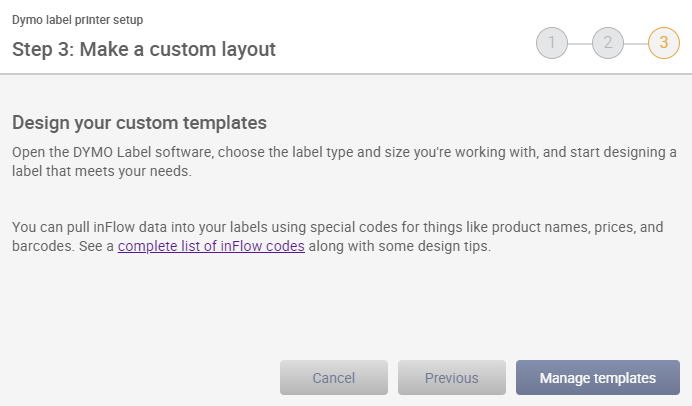 Click on the Manage templates button to upload one of your pre-made templates for inFlow. 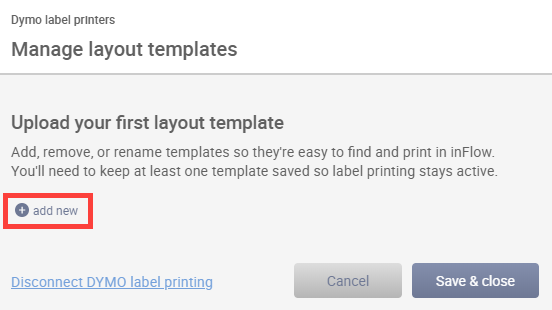 Click the add new button to upload the templates to inFlow. Once you’ve found the label file you want add to inFlow click the Upload button to save it to inFlow. To preview any of the templates that you’ve added you can click the eye icon. Click Save & Close when you’re done uploading your labels. You’ve completed the setup. To start printing labels open the inFlow Cloud for Windows app. How can I print labels from the inFlow Windows app? Labels can be printed from the product record, purchase order, and work order screens. See below for how you can print from each of these areas. On all label printing screens you can choose how many copies of the label you want to print, choose the template from the Layout template drop-down menu, and you can select which Dymo printer you want to print your labels too. 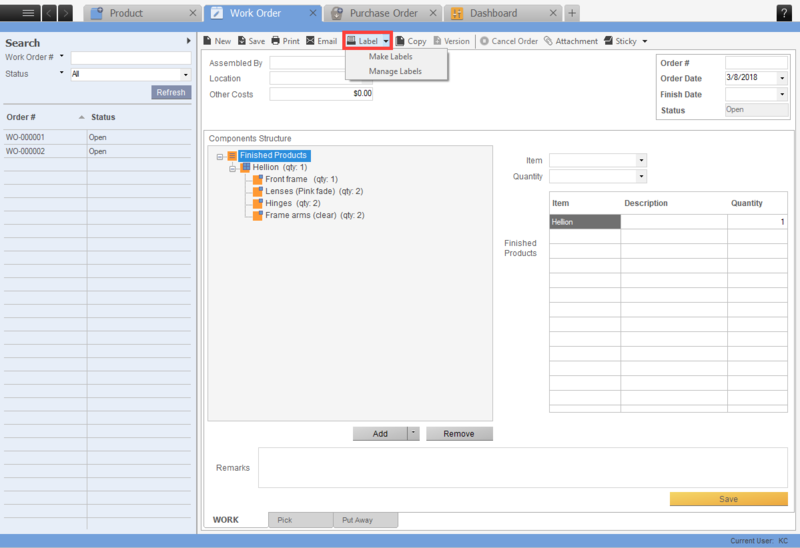 You can also add, or remove labels in inFlow by clicking on any of the Label buttons then clicking on Manage Labels. In inFlow go to Main Menu > Inventory > Product List. Open any product from your list. Click on the Label button, select the Make Labels button. Select the template you’d like to print, and the number of copies. Click the Print when you’re done. Open your current stock window by going to Main Menu > Inventory > Current stock. If you don’t want to print labels for everything in this list, you can filter it to show only the products you want to print labels for (e.g., all the products at one location). Right click on the title line of the table and select Print labels for these items. The current stock screen will only load labels for items that you have in stock, any items with zero or negative inventory won’t load in the Labels window. Open a purchase order by going to Main Menu > Purchasing. 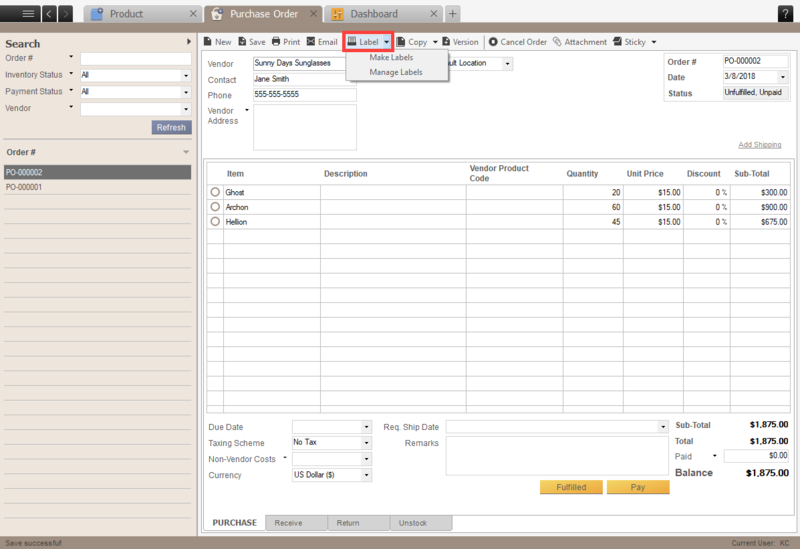 To create a new order click on New Purchase order, or click on Purchase Order List to open an existing order. Click on the Label button, and select Make Labels. 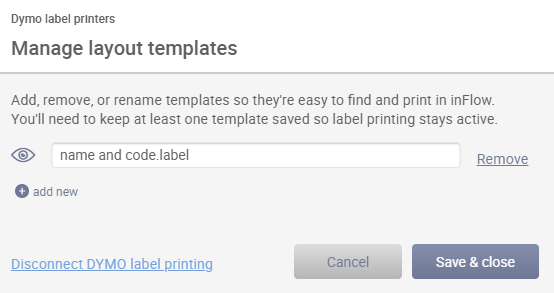 Select the items you’d like to print labels for, and how many copies. 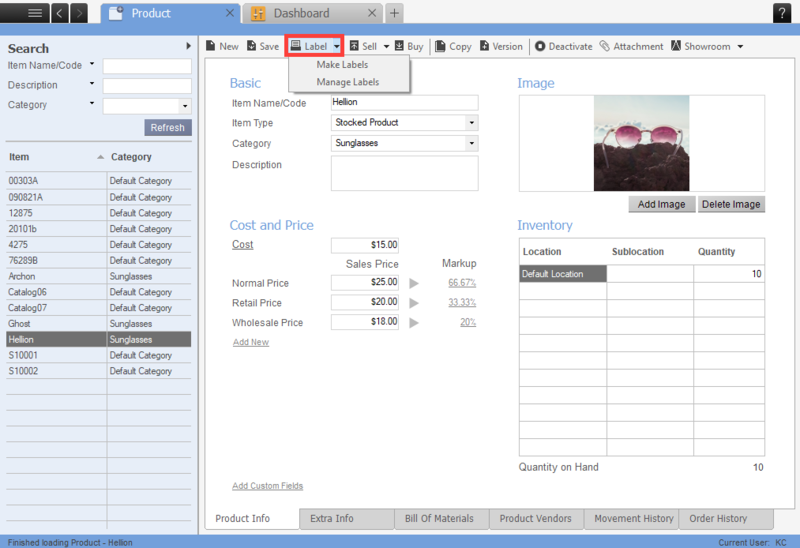 For both purchase and work orders the number of copies listed in the Make Labels screen is equal to the quantity of those items on your order. Open a work order by going to Main Menu > Inventory > Work Order. Select a work order from your list. Click on the Label button at the top of the work order. You have the option of printing labels for the finished item, the components, or both the finished item and the components.